The four musicians in Classical Mystery Tour look and sound just like The Beatles, but Classical Mystery Tour is more than just a rock concert. The full show presents some 30 Beatles tunes sung, played, and performed exactly as they were written. Hear “Penny Lane” with a live trumpet section; experience the beauty of “Yesterday” with an acoustic guitar and string quartet; enjoy the rock/classical blend on the hard edged “I Am the Walrus.” From early Beatles music on through the solo years, Classical Mystery Tour is the best of The Beatles like you’ve never heard them: totally live. Classical Mystery Tour features Jim Owen (John Lennon) on rhythm guitar, piano, and vocals; Tony Kishman (Paul McCartney) on bass guitar, piano, and vocals; David John (George Harrison) on lead guitar and vocals; and Chris Camilleri (Ringo Starr) on drums and vocals. Martin Herman, who transcribed the musical scores note for note from Beatles recordings, conducts many of the Classical Mystery Tour concerts. From the recent success of The Beatles Rock Band to the release of the re-mastered Beatles albums, the demand for Beatles material is greater than ever. 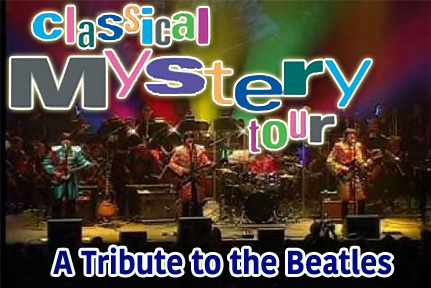 Many Beatles fans never had the opportunity to experience a live Beatles show; Classical Mystery Tour offers that live experience in the comfort of a concert hall. Experience the excitement of Classical Mystery Tour—coming to a city near you soon!